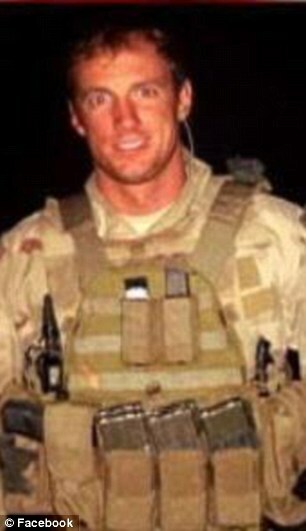 ***NOTE: The following letter to President Obama was written by Billy and Karen Vaughn, parents of Aaron Carson Vaughn of SEAL Team VI who was killed in action in Afghanistan on 8/6/11. It was originally published on WorldTribune.com 2 weeks ago and is re-printed here with the Vaughns’ permission. Learn more about their story at www.forourson.us. Amazingly, in five short years, your administration has lurched from one disaster to another. You spearheaded the ambitious rush to end the wars in both Iraq and Afghanistan — with no plan on how to do so effectively. Also, the release of “the Taliban five” in exchange for one American — without consulting Congress — is on your shoulders. 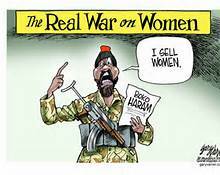 We hear a lot about the so-called War on Women these days. Usually, it’s in the context of some Democrat accusing some Republican of waging that war by allegedly denying women access to abortion or birth control—as if those were the only things women should care about. The truth is there really is a War on Women going on today, but the most vocal opponents of this war always seem to be looking in the wrong places for it. On Thursday, a Sudanese Christian woman, who is 8 months pregnant, was sentenced to death for refusing to deny her faith. Twenty-six-year-old Meriam Ibrahim was raised as a Christian by her mother after her Muslim father left them when she was a small child. Her father’s family claims she was born a Muslim and turned away from Islam when she married a Christian man, Daniel Wani, who is from southern Sudan and is also an American citizen. He fled Sudan as a child during the civil war and then returned. Along with the death sentence, the court in Sudan’s capital of Khartoum also said she should be given 100 lashes for having “illegitimate” sexual relations with her husband (because he’s a Christian), whom she officially married in 2011. The couple also has an 18-month-old son who has been in jail with Meriam. Her lawyer is planning to appeal this conviction saying that the judge was “thinking more of Islamic Shariah laws than of the country’s laws and its constitution” when he claimed Meriam’s marriage was void due to marrying a Christian. In recent years, many Sudanese have been convicted of apostasy, but escaped execution when they recanted their faith. Short of a miracle, Meriam Ibrahim will face death by hanging for her faith in Jesus Christ. Amnesty International has come out in support of Meriam calling the conviction “abhorrent”. No word yet on whether President Obama will pick up the phone to lend his support to her as he did to Sandra Fluke in her demands for taxpayer-funded contraception. There have also not been any new Tweets from a sober-faced Michelle Obama bearing a sheet of paper with #SetMeriamFree written on it. Why should Americans care what happens to some woman living halfway around the world? The same reason we should care what happens to the Nigerian schoolgirls who are still in the hands of Boko Haram, a bunch of shariah-loving terrorists. An opinion piece last week in The Wall Street Journal gives an excellent wake-up call to the West regarding radical political Islam and shariah law. It was written by Ayaan Hirsi Ali, a Somali-born American woman who advocates for the rights of women around the world and is critical of Islam and its practice of female genital mutilation. As a 5-year-old girl she was forced to undergo the procedure, so she is well aware of the pain and oppression women suffer under shariah law. Ali was to have been given an honorary degree this year from Brandeis University, but due to her outspokenness on Islam and the Brandeis administration’s kowtowing to Islamic support groups like CAIR, the honor has been withdrawn. No supportive phone calls or Tweets for her either…only the lonely sound of crickets chirping as the war rages on. Wake Up! It’s Monday Again! In a couple of days, we’ll mark another anniversary of the terrorist attacks in New York, Virginia and Pennsylvania that took the lives of nearly 3,000 people. It’s also the first anniversary of the attack on our embassy in Benghazi that left our ambassador there dead, along with three brave Americans. That second incident could never have happened, I’m afraid, without some amount of forgetting about the first one by some people in very high places. It appears now we may be on the eve of yet another war…this time, though, our brave soldiers will be sent to Syria to fight on the side of the people who took down those two massive towers—and left the lives of thousands changed forever. Sure, we’re being told that this isn’t going to war, necessarily- just some very precise strikes at certain locations. Does anyone really believe this? Given the record of this president and his cohorts, how can we ever trust what they say? These are the same people who blamed the Benghazi attack on a poorly-made You Tube movie by some guy no one ever heard of (who only recently got out of jail on supposedly “unrelated charges”). They’re the same people who, to this day, refer to the deadly shootings at Fort Hood in 2009, as an incident of “workplace violence” instead of calling it what it really was. Just for future reference, Mr. President and Mr. Eric Holder: when someone shouts “Allahu Akbar” (“Allah is greater”) while shooting American soldiers—or while flying planes full of people into buildings full of people—he or she is in full jihadi mode. It’s called a terrorist attack. They also ignored warnings from Russian intelligence about the two brothers who executed a successful attack at the Boston Marathon earlier this year where 3 people died and hundreds more sustained life-altering injuries. At least that one they did see fit to call an act of terrorism, even though they had proclaimed last year that the War on Terror was officially over. In fact, when Obama became president, he didn’t even want the phrase to be a part of the government’s lexicon, preferring to call the War on Terror an “overseas contingency operation”. Political correctness gone wild. The words from the song noted above were written by John Ondrasik of Five for Fighting. He captures very well the mindset of Monday, September 10, 2001. I wouldn’t say we were a nation of innocence and naiveté back then, but compared to what happened on Tuesday and in the years since, it pretty much was an innocent time. Maybe we’ve forgotten that there was once a time when people who took you to the airport or picked you up could actually go right up to the gate. Or that getting on a plane didn’t involve removing any articles of clothing or being touched by a total stranger. The Constitution of the United States has taken a brutal beating over the past twelve years (even before Obama) to the point that the Founding Fathers wouldn’t recognize it or the nation that still claims to be governed by it. It’s easy and maybe even convenient for those of us who didn’t lose a loved one, either on 9/11/01 or 9/11/12 to allow our memories of these days to fade, only to look back once a year when we’re sure to see some retrospective on a cable news channel. But for those who lost someone, they live with the results of terrorism every day. They’d probably give anything for it to be Monday, September 10th again, just to have one last chance to see, talk to or hug the one they lost. Many of us haven’t forgotten them, but I’m not so sure about our “leaders”. It took less than a dozen years to go from Never Forget…to Try to Remember. ***NOTE: You can listen to “Tuesday” by Five for Fighting HERE. And watch my video tribute to the victims of 9/11/01 by clicking the “Remembering 9/11/01” photo that is always linked from this page. If the news that the National Security Administration is spying on all of us didn’t burn you up this summer, maybe this will get your attention. The Department of Defense released a training document (thanks to the efforts of Judicial Watch) that teaches our military men and women how to recognize extremists in and outside of the Armed Forces. What’s wrong with that? Nothing…until you start to read the document. To begin, it relies heavily on information provided by the Southern Poverty Law Center, a far-left organization that defines any group or individual that disagrees with them as extremists. Conservative organizations such as the Family Research Council and the American Family Association are lumped in with true extremists and hate-mongers like the skinheads as far as the SPLC is concerned. In fact, in August of 2012, when the headquarters of the Family Research Council was attacked by a lone gunman, he later admitted that he targeted the employees of that organization because he saw it listed on the SPLC’s website for being “anti-gay”. As you can see, the SPLC has some radical supporters of its own. This is why leftists routinely say that anyone who speaks of freedom, liberty or states’ rights is speaking “code words” to hide their racist beliefs. When the training manual describes the ultimate racist group, the Ku Klux Klan and gives its history, it mentions that it was a Christian organization, yet doesn’t mention that it was started by white Democrats. It lists September 11, 2001 as an “historical event” tied to al-Qaeda, but neglects to mention who al-Qaeda is: followers of Islamic sharia law. Speaking of al-Qaeda, a separate document released by the Pentagon was obtained by the Chaplain Alliance for Religious Liberty within days of the first document that Judicial Watch had found. This second document goes so far as to link Evangelical Christianity and Catholicism with the same religious extremism as al-Qaeda and Hamas! It’s plain to see what Obama’s Department of Defense thinks of conservatives, people who talk about personal liberty and religious people (namely, Catholics and Evangelicals). In fact, it seems to be a pattern throughout the administration: the IRS giving extra scrutiny to conservative and pro-life groups; the Obamacare mandate forcing employers to pay for birth control, even those opposed to it for religious reasons; the hostility shown to military members who wish to share their faith—the list grows with each passing day. One more thing about that document: it lists several personality traits or tendencies of extremists that sound all-too-familiar. Some of the traits are: character assassination, name calling and labeling, the use of sweeping generalizations, use of slogans and buzzwords and assumption of moral superiority over others. Sounds to me like the Obama 2012 election campaign strategy. My favorite was the last extremist tendency: the advocacy of double standards: “Extremists generally tend to judge themselves or their interest group in terms of their intentions, which they tend to view generously, and their critics and opponents by their acts, which they tend to view very critically. They would like you to accept their assertions on faith, but they demand proof for yours”. Now that sounds like Al Gore. A few months ago, I wrote a post called “The Ugly Truth” where I wrote about the infiltration of members of the Muslim Brotherhood into the highest levels of our government, including the State Department and Homeland Security. This infiltration is part of the plan of the Muslim Brotherhood to destroy the West from within, as stated in one of the organization’s own documents known as The Project. They’ve been working their plan…and unfortunately for freedom-loving people, their plan is working. Even as the “Arab Spring” was happening in early 2011, the Obama administration and the media—wait, those are one in the same—were telling us this movement was mostly “peaceful” and would usher in democracies in these nations. What took hold instead –namely in Egypt– was the Muslim Brotherhood, which we were told was a “largely secular” organization. Not so. They are deeply committed to the goals of political Islam, including implementation of worldwide “sharia law”. When we found ourselves on the 11th anniversary of the terrorist attacks of 2001 a couple of weeks ago, it became another day of violence and death for 4 Americans, including our ambassador to Libya. Instead of calling this what it was from the beginning—a planned terrorist attack against our interests in a foreign country—Obama and friends wanted us to believe the violence was the result of protests against a You Tube video that no one until that time had even seen. The video supposedly makes the prophet Mohammed look bad, and so was offensive to Muslims. The calls for some suspension of our First Amendment freedom of speech aren’t just coming from random protesters in far-away countries who hate us, although that’s definitely the case. They’ve been coming for some time from the far left in our country, who blames conservative talk radio anytime a lone gunman walks into a public place and murders people. Just yesterday Slate.com posted an article called “The World Doesn’t Love the First Amendment”. The article is attempting to make the case that, since we are now a global society linked by the new media, we need to think about what might be offensive to people in other countries who do not have our constitutional freedom of speech. Since when does everyone on the face of the earth have the right to NOT be offended? What’s a joke to one, offends another. What’s art to this person is blasphemy to that person. Who will decide? That’s where the Muslim Brotherhood’s “Project” comes in. If you were to read The Project, you would know that in order to achieve their goal of one world under Islam, they must silence any opposition—including that of the moderate followers of Islam. Are you aware that this week, as the United Nations General Assembly continues, members of several Muslim nations are calling for a UN worldwide blasphemy law that bans any insults of the prophet Mohammed? They’ve wanted this for years, but are now using the bad You Tube video for leverage in pleading their case. Did you further know that Hillary Clinton has already given support to a so-called “religious tolerance” resolution (Resolution 16/18 of the UN’s Human Rights Council) in conjunction with the Organization of Islamic Cooperation ? This has already occurred, so it’s not just some conspiracy theory which we can brush off and say, “That will never happen.” What else can we expect from the Secretary of State whose “right-hand woman” has very close ties to the Muslim Brotherhood? It took the Obama administration more than a week to finally admit the attacks on our embassies were terrorist attacks. He said as much yesterday on “The View”, but even after that appearance, he spent a lot of time in his speech to the UN last night talking about that stupid video! His speech also included this little gem of a statement: “The future must not belong to those who slander the prophet of Islam. But to be credible, those who condemn that slander must also condemn the hate we see in the images of Jesus Christ that are desecrated, or churches that are destroyed, or the Holocaust that is denied.” Wasn’t it nice that he threw that bone to Christians and Jews? Judging by his actions, his mindset is more in line with the Muslim Brotherhood than with that of the prime minister of Israel or the Pope. Michelle Malkin has a really good article today related to this topic (“Who Is White House Visitor Hisham Altalib?”). I encourage you to read it and to decide whether you believe this is enough of a threat to our nation to tell others about it. If you’re reading this and you still believe that it doesn’t matter who wins the election in November, you need to wake up and smell the coffee…quickly! You’ve not been paying attention to the signs of the times and have a lot of catching up to do before then. On another Tuesday morning eleven years ago today, the Twin Towers of the World Trade Center cast their final shadows over the neighboring buildings in lower Manhattan. Before noon that day, the shadows would be gone, and so were the towers. The world– and the New York City skyline– had changed forever. One small, unassuming building that miraculously escaped the effects of the collapse of the towers and the resulting hurricane of debris and humanity was St. Paul’s Chapel. As the oldest continuous-use public building in New York City, it survived the burning of New York in September 1776 when the British re-took the city from the Continental army. Back then, St. Paul’s was saved by a bucket brigade. Flash forward to 2001, and it was saved by a 100-year-old sycamore tree that bore the brunt of the towers’ collapse, shielding the small building as if Divine Providence were saving it for a special purpose. 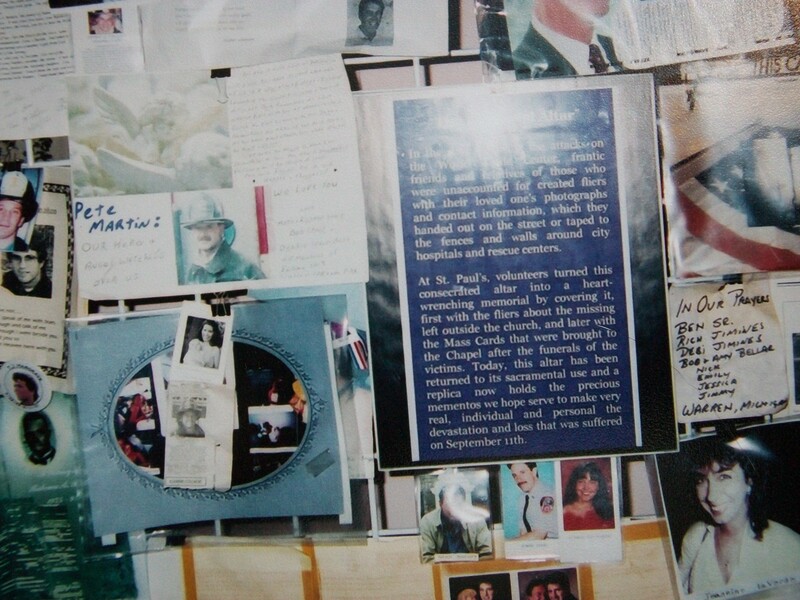 Exhibit inside St. Paul’s Chapel memorializes those who died. Volunteers from all faiths and walks of life came from around the country to help the helpers. This ministry to the workers at Ground Zero continued for several months until the recovery work officially ended in May 2002. George Washington sat here: this is where our first president prayed and worshiped at St. Paul’s during his time in New York. The same could be said of the little chapel that survived the fall of the Twin Towers. 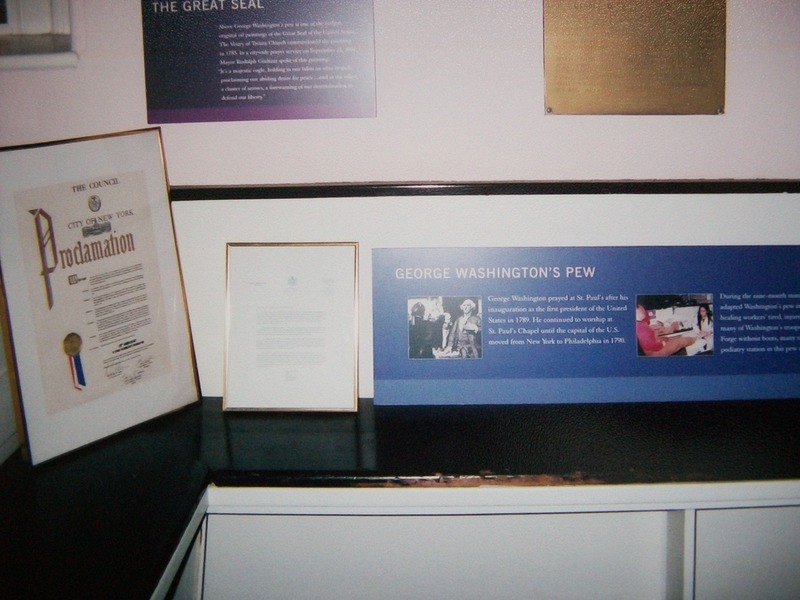 Today, St. Paul’s Chapel remains, as always, a place of worship, but also serves as sort of a mini-museum to where the events of September 11, 2001 can be remembered and reflected upon by all who visit there. Several exhibits memorialize those who perished, and pay tribute to the brave police officers, firemen and other first-responders who put themselves in harm’s way in order to save others. 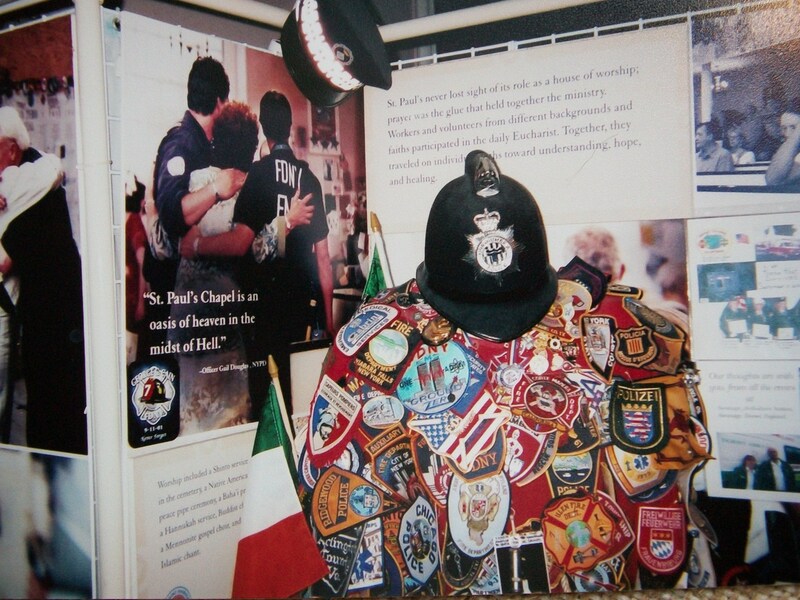 Another St. Paul’s exhibit: police and fire departments from all over the world sent their badges and other items in support of the workers at Ground Zero. The first time I saw it, I was on a mission trip to New York City in June, 2002—just about 9 and a half months after the terrorist attacks. 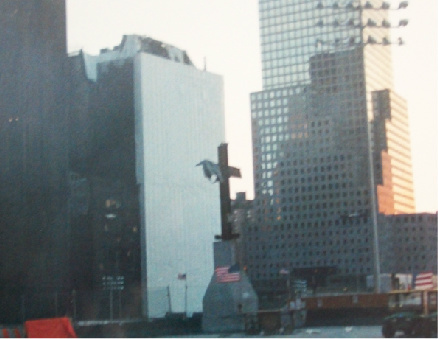 The Cross at Ground Zero stood on a pedestal with an American flag waving at the base of it. At that time, efforts to recover those who perished had recently been completed. It was, and still is considered to be sacred ground, even as construction continues there to this day. The two intersecting steel beams where found by construction workers in the rubble in the days following September 11, 2001. The cross became a source of comfort to people of all faiths who worked at the site, as well as to those who have visited for more than a decade. It’s no surprise of course that atheist organizations have expressed their displeasure with the icon over the years. Most recently, American Atheists has filed a lawsuit that claims, oddly enough, that the cross at Ground Zero is making them sick. According to WorldNet Daily, the lawsuit, American Atheists v. Port Authority of New York and New Jersey makes the bizarre claim that the plaintiffs “have suffered …. dyspepsia, symptoms of depression, headaches, anxiety, and mental pain and anguish from the knowledge that they are made to feel officially excluded from the ranks of citizens who were directly injured by the 9/11 attack.” They go on to make the suggestion that at the very least, they’d like to have a 17-foot “A for atheists” structure built in order to promote their non-beliefs at Ground Zero. Jay Sekulow, Chief Counsel for the American Center for Law and Justice calls the lawsuit “absurd” and countered by filing a friend- of- the- court brief signed by more than 100,000 people in support of the Ground Zero Cross. Even other atheist groups find the lawsuit to be a frivolous waste of time. Susan Jacoby, who writes an atheist blog for The Washington Post, agreed it “misconstrues the First Amendment”. It’s unlikely American Atheists will get very far with this particular lawsuit, but still they’ll press on, looking for some other thing, somewhere to offend them. In fact, they seem to spend an awful lot of time and energy railing against Someone they say they don’t even believe exists. They’re either the stupidest people on the planet, or there’s something else going on here. To put it another way, let’s look at unicorns. I don’t believe they exist. Until I just typed that sentence, I haven’t thought about them. I don’t start organizations or give to organizations that try to get other people to believe unicorns don’t exist. I don’t file lawsuits to attempt to remove all unicorns from public display. When I see a picture of one, I don’t claim physical illness or mental distress. They just aren’t on my radar. Perhaps these atheists are feeling physical symptoms because something deep inside themselves that they can’t control is coming to the surface. The part they deny exists (the spirit) is trying to break free. For an atheist, the Ground Zero Cross may not be causing indigestion so much as it’s causing conviction. *** UPDATE: 4/1/13: On Friday (Good Friday), March 29, 2013, New York Federal Judge Deborah Batts rejected the atheist group’s arguments and threw this case out. You can read about it here. A victory for common sense and The Cross. What a relief! But wait a minute…aren’t the people who are declaring it’s over the same people who have refused to believe there even is/ was a War on Terror, and in fact, even wiped that term from their State Department vocabulary? What are these “legitimate means of expression” that those who once were attracted to Al Qaeda tactics likely to embrace now? Enter the Muslim Brotherhood. When I saw Brigitte Gabriel speak several weeks ago, she called this organization the “mother ship” of all terrorist groups, which a couple of decades ago, laid out their plans for America in what she says is called “The Project”. It details the MB’s plan to infiltrate the West in order to topple it by taking on the appearance of moderation (think terrorists in suits and ties). Although both parties are to blame for this, no one has done more than Barack Hussein Obama to legitimize the radical ideology of the Muslim Brotherhood and welcome them into the highest levels of our government. He went on to name Rashad Hussain, an American attorney, and U.S. Special Envoy to the Organization of Islamic Cooperation (OIC), an intergovernmental group with 57 member Muslim states (and an openly anti-Israel organization); Dalia Mogahed, his speech writer who comes from the Muslim Brotherhood in Egypt (the brains behind his speeches praising the “Arab Spring”? ); and “another woman, an academic, was appointed in that circle” (but he didn’t say the name of this woman). His full remarks can be found here. Fatah forgot to name another MB-connected White House staffer: Huma Abedin, Deputy Chief of Staff and aide to U.S. Secretary of State Hillary Rodham Clinton. Yes, right there in the State Department, is a woman who was American-born, and Saudi Arabia-raised. Incidentally, both of her parents were educators who were members of the Muslim Brotherhood. If we had a Republican president, this would be more than enough to have the media and Democrats in Congress screaming for impeachment…but under this president, all is well. Even more troubling is that the above people aren’t the only ones who have been or currently are in high-level offices in the Obama Administration that have connections to terrorist organizations (those affiliated with the Muslim Brotherhood as listed in “The Project” & identified by our State Department as aiding terrorism in the past!). Here’s a few more names: Arif Alikahn, Salam al-Marayati, Mohamed Elibiary, Imam Mohamed Magid, and Eboo Patel. The Blaze website has more information on these characters, as well as a link to a free documentary on this subject entitled, “Rumors of War III: Target U.S.”**WARNING: Everyone should watch this because you won’t see it on the news, but it will scare the h@#ll out of you! In an ironic twist, this “ending” of the War on Terror this week came right before the 207th anniversary of our first—and often forgotten—victory against radical Islamists on the “shores of Tripoli”. Back then, we had a president in Thomas Jefferson that had not only studied the Koran as a young law student—he understood that its teachings were a threat to free people everywhere. So, after years of being bullied on the high seas by the Barbary Coast pirates—and after attempts to appease them failed, as they always will—Jefferson sent the USS Constitution into the Mediterranean Sea to deal with the thugs. On April 27, 1805, the Marines beat down the enemy forces and the event was later immortalized in the Marine Corps Hymn. 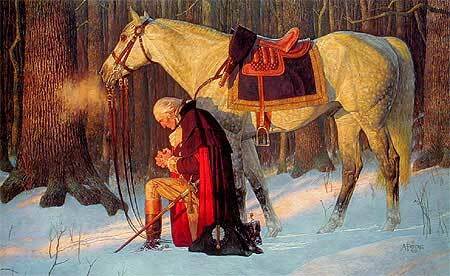 President Jefferson knew the enemy, and he knew the only way to deal with them is to defeat them in battle. There isn’t any negotiating with an enemy that wants to destroy your life, and you certainly don’t invite them into your house. It was true then, and it’s still true today. Earlier this week, I took the opportunity to go see a speaker who’s been on the frontlines of (what used to be called) the War on Terror from the time she was a child, though she didn’t know it then. She does now, and when Brigitte Gabriel speaks, she speaks with passion, conviction and a sense of urgency as she warns Americans about the dangers posed by radical Islam and sharia law. She does this because she speaks from experience. When she was 10 years old in 1975, her village in Lebanon was attacked by Islamic terrorists. She was pulled from the rubble and spent the next couple of months recovering from her injuries before she could be released to go home…but not the home she knew- that was gone. Ms. Gabriel and her parents spent the next seven years living in an underground bomb shelter. Her father had been rendered deaf by the attack. She and her mother were left to scrape together whatever food and water they could find when they ventured out together, dodging more gunfire and bombs on a daily basis. As a child, she couldn’t understand why people would want to do that to her. Robbed of her childhood, she lived all those years with the knowledge that she could die at any moment. To say that it’s a miracle she’s still alive would be an understatement. I would say that she was preserved by God Himself for a very important purpose. After working as a journalist in Israel, Ms. Gabriel immigrated to the United States and started an organization that is now the largest grassroots organization in the country dedicated to national security. ACT! for America says its mission is “to give Americans concerned about national security, terrorism, and the threat of radical Islam, a powerful, organized, informed and mobilized voice.” The organization has chapters in nearly every state, as well as several foreign countries. Much of their effort is focused on education, and Ms. Gabriel talked about this quite a bit. The influence of those who would insinuate Islamic doctrine and culture into our schools haven’t limited themselves to college campuses, however. As Ms. Gabriel explained, these university Arabic/Islamic/Middle Eastern studies programs offer training to K-12 public and private school teachers using Title VI of the Higher Education Act as a way to get their programs in the school house doors. It allows them to bypass the usual local school board scrutiny of curriculum in what she called ‘stealth jihad”. I went looking for information to back up her claim and found a really good and more detailed article from 2007 that appeared in National Review Online that supports what she said. What’s more, she explained, organizations such as the Council on American-Islamic Relations (CAIR) began providing consultants to the top educational publishing houses to influence the way Muslims are represented in history books. For example, she said the concept of “jihad” is recommended to be taught as Muslim resistance against oppression. Ms. Gabriel explained that history books containing the events of September 11, 2001 do not refer to the hijackers as Muslims, nor do they teach that the hijackers—by their own admission– were waging a jihad against America. She said the term is used multiple times in the Koran, most often to refer to violent acts against “infidels”. For the past decade, we’ve seen them in home videos and grainy photographs taken by friends and family, as well as professional portfolio pictures. Many are in uniform, while others are dressed for formal occasions or the beach. Most are smiling. Some of their faces have become familiar to us over the years because of their heroic actions on that day ten years ago. Some are heroes only to those who shared their lives. 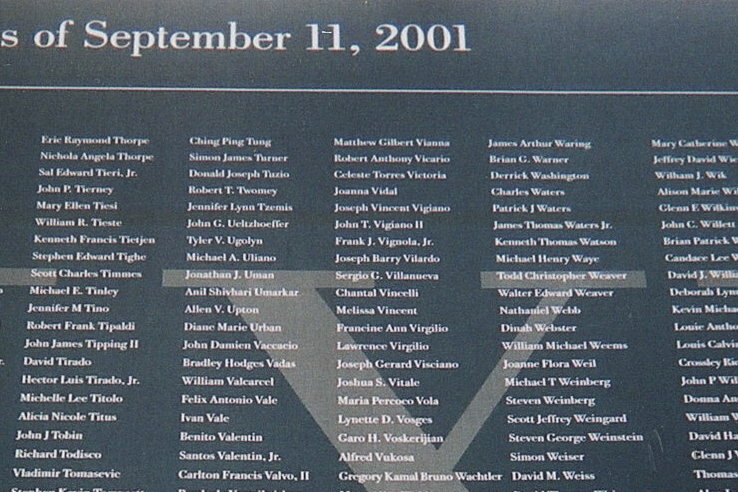 These are the faces of the victims of September 11, 2001. In putting together this tribute for the 10th anniversary of the terrorist attacks, I spent many hours looking through lists of victims from all three sites. I read their stories and comments made about them on memorial websites by those who loved them. With the exception of just a handful of the 80 people shown, I chose them pretty randomly. I tried to give a good representation of the age range and walks of life of the people who died that day. I hope I succeeded.